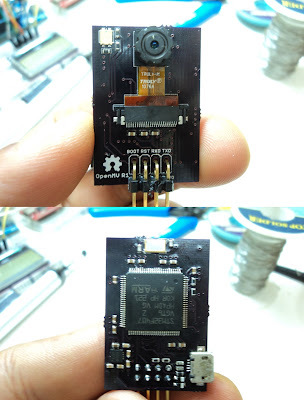 Dimensions: 2.1" x 1.75" x 1.4"
OpenMV is an open-source tiny machine vision module based on an STM32F4xx ARM Cortex-M4 MCU and an OV9650 sensor, it's currently capable of doing face detection at 25FPS, color tracking at 30FPS+ and has USART interfae and USB-OTG support for debugging and firmware update. This repo contains the hardware resources, drivers, image processing and userspace code. Can be easily ported to any platforms which have SPI port like Raspberry Pi, BeagleBoard, BeagleBone, pcDuino. There is also the option of getting a miniature embedded android/linux, linking a webcam and running opencv. Alternatively there's RoboRealm which offloads the processing to a remote Windows PC. The embedded linux only needs to send image frames over wifi.